The Forgotten Son is the first in a new range of books from Candy Jar Books based around the life of Lethbridge-Stewart. With an introduction by Terrance Dicks, this is the first of a range of stories filling out the Brigadier-to-be’s life. Andy Frankham-Allen wrote this story to show us what happened after Web of Fear and also to give us a back-story for the Brigadier. How well does it work? The Forgotten Son starts with London being repopulated following evacuation. Lethbridge-Stewart is looking forward to a break with his girlfriend/fiancée, so of course things become unpicked. Meanwhile something mysterious is happening in the small Cornish village of Bledoe and a certain Mary Gore is hearing voices and has started a journey that will have a major impact on Lethbridge-Stewart. As the story unfolds it works in plenty of elements from The Web of Fear and resurrects a lot of the threat in a convincing yet puzzling manner. 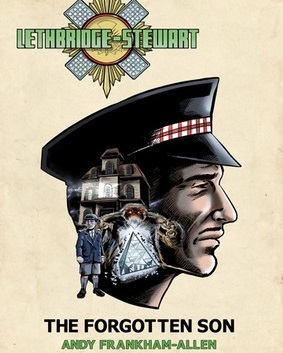 It becomes apparent something else is happening in Bledoe, something intimately connected to Lethbridge-Stewart himself. The action moves to Cornwall and as Yeti are once more seen abroad, we learn a lot about the early life of a certain Scots Guard, and particularly his family. In the end the story picks themes from the original concepts of the Great Intelligence, blending mysticism with time travel in a way that fits the story though sets this apart from how the TV show has evolved. The scene is set for several more stories, which is just as well! Due to a production problem, my eBook version of this had formatting issues in that many scene breaks ran on without a blank line. This mean I found it really had to tell what was happening and continually had to re-read short pieces. The story is dark and feels very 1960s giving us a character from a pre-60s world dealing with a futuristic problem. This I liked, What I didn’t like as much is the way the evolving story increasingly linked the Brig’s early life to the Great Intelligence yet as far as we know his involvement in The Web of Fear was coincidental. This is explained at the end but not before I had grown irritated. This all aside I enjoyed reading it and will keep an eye open for others in this series.